George Stoney, Father of Public Access R.I.P. It is with a heavy heart that I share the news that George Stoney, the founder of our movement, unflagging champion of free speech, open media and opportunity for all, has died in his home in New York City this evening. George was well into his 90's and actively producing movies and supporting access advocates until the end. 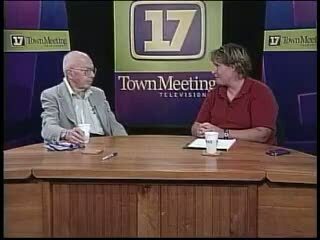 George first came to Vermont in 1985 to help us train community members during the early years of CCTV and, then, Channel 8 in Chittenden County. He brought his bag of VHS tapes to show what others were doing and reminded us that our work is less about media making and more about community building--a message he never failed to deliver at the countless access events and conferences that he attended. George was brilliant, gracious, untiring and a deep inspiration to us all. He traveled and had friends around the world, was recognized with high honors, made dozens of films and taught thousands of students. Last year, I attended a class at NYU which featured footage from the Canadian Film Board's Challenge for Change project, which first convinced him of the power of video to animate social change. Still teaching at 95!! Thanks to George and our collective hard work, we have forged a vital community resource that can make our state a better place for all people. Opportunity and equity. The seeds and fruit of our efforts.